Waterstop is " A section of flexible waterproofing material placed at any joint in concrete to prevent passage of water ". Joints in concrete structures, one side is subject to hydrostatic load, are provided with waterstops bridging the joints and embedded in concrete on either side. In concrete joints where expansion and contraction cause the joints to close and open, waterstop then are designed to accommodate itself to such movements. Flexijoint Thermo Rubber Waterstops are superior in performance than metal or pvc withstanding shear movements resisting hydrostatic pressure. Flexijoint Thermo Rubber Waterstop have greater ultimate elongation minimum 350% and will continue returning to near original shape after repeated movement. They have lower compression set and perform well at low temperatures. Flexijoint Thermo Rubber ( TPR ) series Waterstop is extruded from specially formulated and blended high grade PVC and rubber compound. It is free from reclaimed PVC and rubber or vulcanized waste. Flexijoint TPR meets local " SIRIM " standard specification and international standard and widely applied in construction industry. Display shown is Flexijoint Thermo Rubber ( TPR ) Waterstop " Dumbell Plain Web " Series of 150mm and 230mm width suitable for construction, kicker and partial contraction joints where no shear movement is possible. Dams, Canals, Culverts, Spillways, Tunnels, Water Towers, Swimming Pools, Reservoirs, Sewerage Tanks, Basements Substructures & Underground Car Parks, Subways, Roof Decks and Podium Areas. 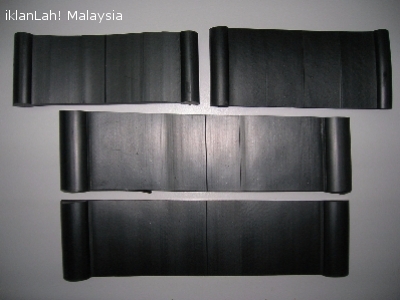 Flexijoint Thermo Rubber ( TPR ) Waterstop by Flexijoint Industries, market and sale by Flexijoint Industrial Marketing & Services, Kuala Lumpur, Malaysia. For further enquiry, please contact us at T: +6 03 79541136 M: +6 016 3111313 F: +6 03 79808259 E: flexijoint.ims@gmail.com.